Third Baseman & SS, RH; Providence Grays 1881-1885; St. Louis Maroons (NL) 1886; Indianapolis Hoosiers (NL) 1887-1889; New York (N) 1890-92; Louisville Colonels (NL) 1893 - Ht.5'11, 180 lbs. Old newspaper accounts credit Jerry Denny as one of the best fielding 3rd basemen of all-time. Of all the third basemen in baseball's long history, Denny remains the leader in chances per game and putouts per game. Jerry Denny usually played without a glove, as was the custom in this period, and was described as 'the most wide-ranging third baseman in history'. While playing for the Providence Grays, on August 17, 1882, he gathered 16 chances in an 18 inning game. Denny was born in New York, N.Y on March 16, 1859 and was raised in orphanages in California. He started playing ball as a 19-year-old youth for the minor league San Francisco Eagles in 1878. 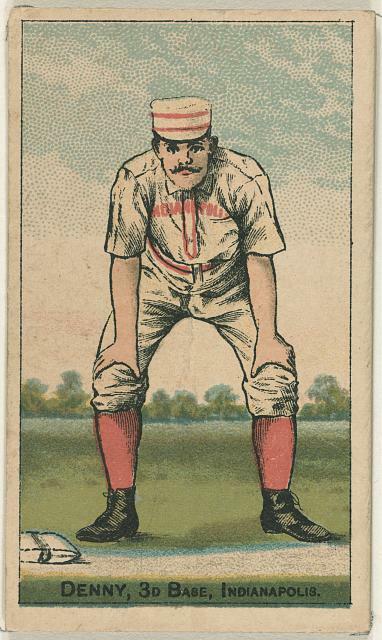 He also played 3rd base for two other San Francisco teams the Stars and Athletics, 1879-1880. Jerry Denny playing 3rd and Arthur Irwin at SS, gave the Providence Grays the best defense on the left-side of the infield during this era. Both players were an important part of the Providence team, which was in the National League from 1878-1885. In 1884, the Providence Grays won the NL pennant and played in the first-ever World Series against the New York Metropolitans. In the second game of the Series, Jerry Denny hit a three-run, 5th inning homer off Mets' star Tim Keefe, enabling the Grays to win the game, 3-1. Denny's home run was the first-ever hit in World Series play.